Breakthrough for A.B. 380! Despite the ongoing budget crunch in Sacramento, A.B. 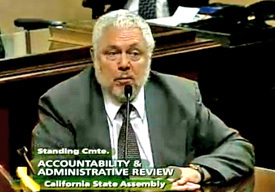 380 -- the Forests Forever-sponsored Comprehensive Forest Land Recovery and Restoration Act authored by Assemblymember Wesley Chesbro (D-North Coast) -- garnered a resounding 79-0 vote of approval by the full Assembly on May 31 and now is making its way through the state Senate! A good woman on our side! Gov. Jerry Brown took an important step in protecting California's forests by appointing biologist Dr. Susan Britting to one of two open public seats on the California Board of Forestry (BOF). Forests Forever had endorsed Britting for the position. She will serve alongside two other Forests Forever-endorsed BOF public members, Mark Andre a nd Bruce Saito. Big win for the Roadless Rule! An unanimous ruling in October by a three-judge panel for the 10th Circuit U.S. Court of Appeals recently affirmed the legality of the Clinton-era regulation protecting more than 58 million acres of inventoried roadless areas nationwide. This includes some 4.4 million mostly forested acres in California. Forests Forever has been fighting for the Roadless Rule since 2001, when we generated thousands of letters and postcards in favor of the popular measure. We also were a co-plaintiff in the victorious 2006 lawsuit that upheld the Rule initially. 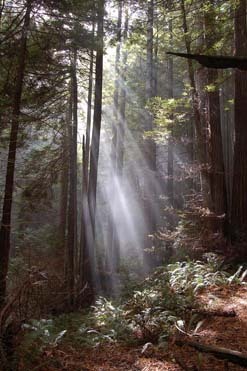 Help Forests Forever keep fighting for California's forests! Save forests and taxpayers! Forests Forever helped call attention to the fact that California taxpayers have been underwriting the annual $18 million bill for state environmental monitoring of logging practices that should be paid by timberland owners! 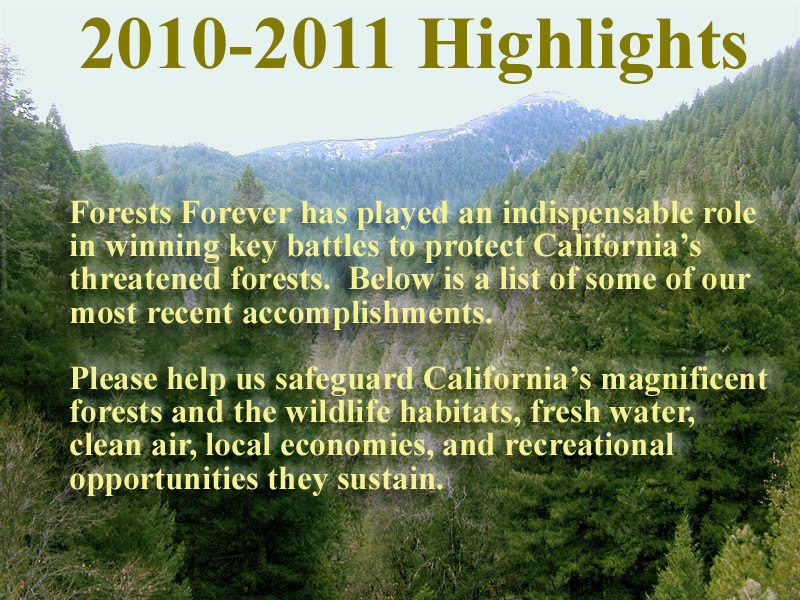 The facts came out in September in an Assembly informational hearing chaired by the author of Forests Forever-sponsored A.B. 1005, Roger Dickinson (D-Sacramento). The measure would restore full and fair funding for the California Dept. of Fish & Game's timber-harvest inspections, which was gutted by former Gov. Arnold Schwarzenegger. Our man in Sacramento: Forests Forever Legislative Advocate Luke Breit (left) earned a seat on the Timber Harvest Working Group, a panel set up by Assemblymembers Wesley Chesbro and Roger Dickinson to strategise about resolving the issue of who should pay for timber's regulatory fees and how. Clearcuts out of cap-and-trade! We urged forest supporters to step up pressure to reform California's deeply flawed cap-and-trade protocol for forests. The state Air Resources Board's regulation, or protocol, irresponsibly allows forest clearcuts to qualify for lucrative clean-air credits! Big bang for the book! 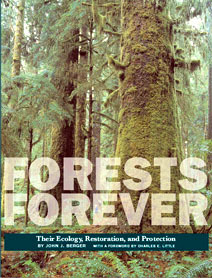 Thanks to a generous grant from the Betty Lo Foundation of San Jose, John J. Berger's Forests Forever: Their Ecology, Restoration and Protection, co-published by Forests Forever Foundation and the Center for American Places at Columbia College Chicago, can now be found in nearly 1000 libraries across North America and around the world! Boost for the grassroots! A key component of Forests Forever's grassroots activism is our direct-contact organizing programs, which make Forests Forever unique among forestry-reform groups. In April we took a giant step by opening a new San Francisco-based field canvass with help from the Hudson Bay Company and its experienced network of talented organizers. Your contributions make these accomplishments possible. Thank you!